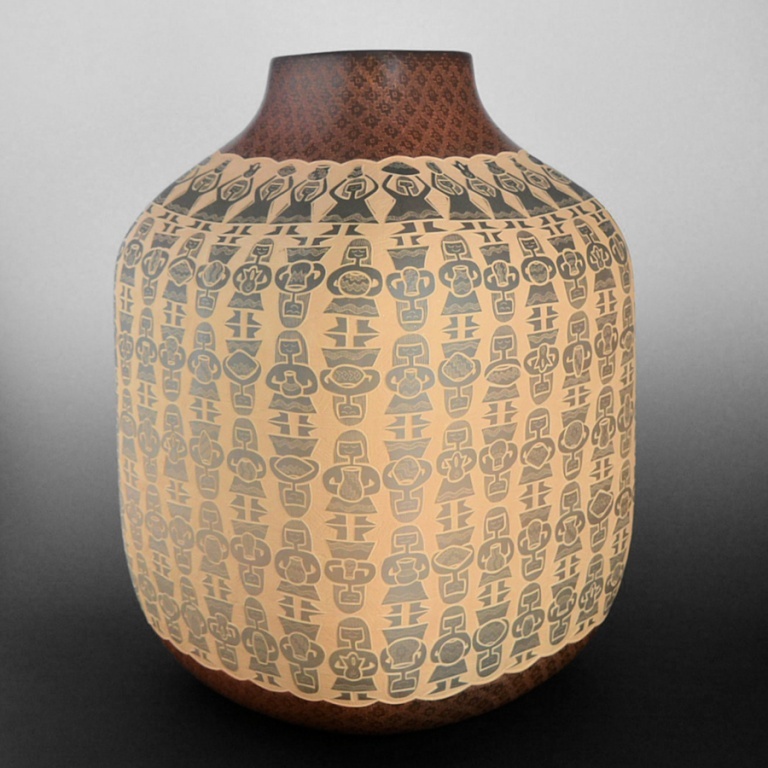 Jody Naranjo, Large Square Jar with 194 Figures. 2003. Earthenware, 15 1/2 x 10 in. gift of Loren G. Lipson, M.D. 2016.97. American Indians of the Southwest began making functional pottery at least 2,000 years ago. The skills needed to make these vessels passed from generation to generation, a tradition that continues to this day. Geographic variations in clay, along with regional preferences for certain designs and shapes, meant that distinct styles became associated with permanent villages, which the Spanish called pueblos. When the railroad brought visitors to the Southwest in the late 19th century, potters responded by selling their wares, and an ongoing market became established for pottery made as art. For the first time, many makers began to sign their work, and individual potters became known and their works collected. These artists drew inspiration from their ancestors and built upon their traditions. Featuring approximately 200 pieces by premier potters, this exhibition focuses on legendary matriarchs such as Nampeyo, Maria Martinez, and Margaret Tafoya, as well as many of their adventuresome descendants, whose art has become increasingly elaborate, detailed, personal, and political over time.